Increasing fuel economy while reducing emissions at the same time is a formidable task facing scientists and automakers. Photo courtesy of Osvaldo Gago. PNNL researchers test emissions equipment in the high bay laboratory at the Applied Process Engineering Laboratory. RICHLAND, Wash. — Inflate your tires. Accelerate slowly. Change the oil. 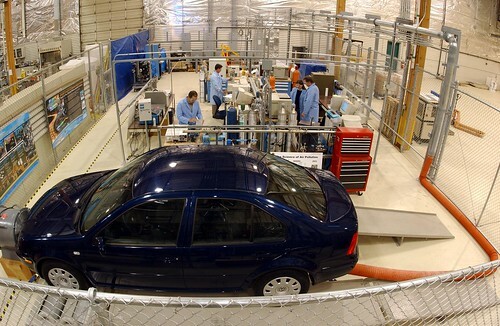 Invest $1.1 million in advanced vehicle research at the Department of Energy's Pacific Northwest National Laboratory. Four ways to boost your mileage. While the first three methods boost fuel efficiency one vehicle at a time, the laboratory research by PNNL scientists — who are creating some of the most sophisticated materials and scientific processes in the world — could benefit millions upon millions of vehicles and their owners, as well as move the nation toward greater energy efficiency and independence. The new funding comes from the U.S. Department of Energy's Office of Energy Efficiency and Renewable Energy. The funds support three PNNL efforts, part of a suite of 38 new projects around the nation supported by more than $45 million in new funding from DOE to improve advanced transportation technologies and boost fuel economy. The projects come in an era when much more is expected of cars and trucks than in the past. Pollution has been cut dramatically and fuel efficiency has risen. That's a difficult feat for manufacturers to pull off, since equipment to reduce pollution typically adds weight, potentially reducing fuel economy. 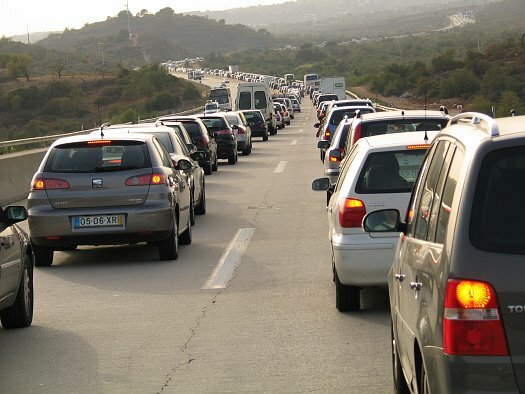 "In the past four decades, automakers have slashed emissions by more than 90 percent. At the same time, fuel efficiency is far above what it used to be," said George Muntean, director of Transportation Programs for PNNL. "The challenge becomes more formidable in the near future, when regulations will call for both less pollution and better mileage simultaneously." In the first project, scientists led by Aashish Rohatgi are looking for ways to make lightweight magnesium easier and more convenient for use in cars and trucks. Magnesium is being used increasingly as a substitute for heavier steel, but manufacturing can be challenging, and the material can be corrosive. The team is analyzing magnesium alloys in depth so engineers can control the manufacturing process more precisely, making the material more convenient for widespread use. In the second project, a team led by Tim Bays and Lelia Cosimbescu is setting out to develop oils and lubricants with the potential to dramatically improve fuel efficiency. Lubricants are crucial for any engine, keeping temperatures cool and keeping wear and tear to a minimum — often allowing vehicles to stay on the road for hundreds of thousands of miles when properly maintained. Again, manufacturers face a formidable trade-off: A lubricant that is "thin" or less viscous results in better fuel efficiency, but if the lubricant is too thin, the engine will have too much wear and tear. The team from PNNL — an institution with a historic strength in chemistry — is out to chemically develop a new type of lubricant that reduces wear and tear while also boosting fuel efficiency beyond conventional lubricants. "The great news here is that a new lubricant could be used in older vehicles," said Muntean. "Even if we can save just a little bit of fuel for each vehicle, there are a whole lot of vehicles out there already that could be equipped with a new lubricant relatively easily." In the third project, led by Ford Motor Co., PNNL scientists Xin Sun and Richard Davies will do computer modeling to help engineers understand how to weld different materials together. This is becoming more important as steel, long the dominant metal in vehicles, is displaced by lighter metals like aluminum and magnesium. Differing properties, such as melting points that vary by hundreds of degrees, make actually putting a car or truck together via welds more challenging than ever.